Hey anyone have the race replay for the Fukuryu Stakes at Nakayama yesterday? SSilence86 wrote: Hey anyone have the race replay for the Fukuryu Stakes at Nakayama yesterday? There is a picture of him here. It's possible that McKinzie might miss the Derby. Rather than rushing his very talented 3-year-old colt McKinzie, trainer Bob Baffert is definitely planning to skip Saturday's Santa Anita Derby and possibly even the Kentucky Derby. The son of Street Sense was a little bit off in a hind leg after last week's breeze, according to drf.com, but both x-rays and a nuclear scan were inconclusive in determining a specific injury. All plans for the colt, winner of both the CashCall Futurity and the Sham Stakes before he was demoted to second for interference in the San Felipe, are currently on hold until his injury can be more specifically diagnosed. Baffert did suggest that McKinzie could be ready in time for the Preakness Stakes. I'm sorry to read this, as he was in my mental Top Five for the Derby. We all know that the Triple Crown trail can take a lot out of a horse, but some of the best runners we've seen in recent years have been colts who blossomed in the second half of the year. Last edited by BaroqueAgain1 on Tue Apr 03, 2018 3:18 pm, edited 1 time in total. And here's the visual - Solomini got the lead change, at least, and looks more relaxed. Solomini has a short neck, and when he has any tension, it is very apparent there. Restoring Hope looks like butter. 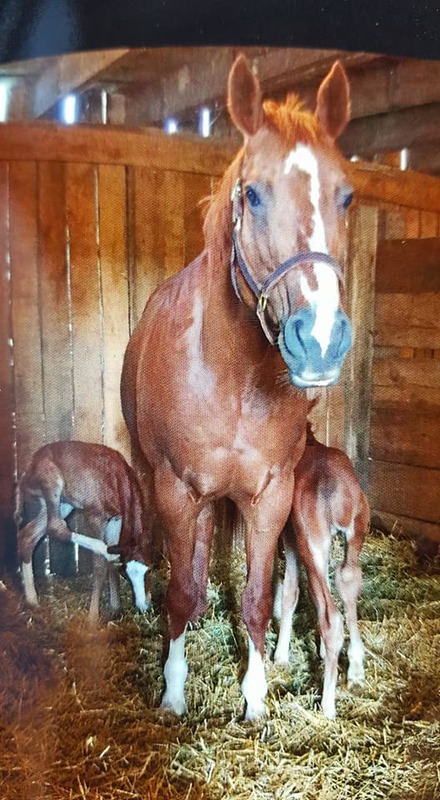 . .
West Virginia's Avonwood Farm shared these photos of rare twins Mr. Ping and Mr. Pong (Denis of Cork), who not only improbably have made it to the races, they debut together at #CharlesTown. @DRFNevills will have more on this story! Regardless of what it says on the tote board, the twins Mr. Ping and Mr. Pong will have already defied astronomical odds when they break from the gate in Friday’s fourth race at Charles Town. The successful birth of twins is rare for horses, especially Thoroughbreds, due to the risks it can pose to both the mare and foals. About 10 percent of Thoroughbred pregnancies initially result in twins, but almost all of them are either brought down to one by a veterinarian, the mare will abort both potential foals, or complications will lead to at least one stillborn foal. Difficulties can continue after birth, and the training process can send horses in any number of directions. Still, these twin 3-year-old Denis of Cork colts, out of the unraced Domestic Dispute mare Washingtonian, will debut together in the same race. The colts were born at Amanda Morro’s Avonwood Farm in Charles Town, W.Va., for owner-breeder John P. Casey. 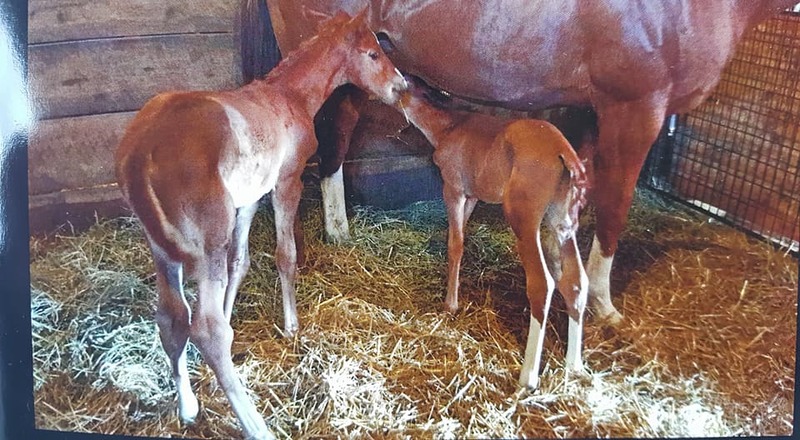 Initial ultrasounds failed to reveal that the mare was carrying twins, and the nearly 17-hands-tall Washingtonian arrived at Avonwood earlier than planned out of concern over different pregnancy complications. When Washingtonian began to foal, Morro was presented with four feet instead of the usual two. Morro thought she was dealing with dystocia – obstructed labor. She tried to hold the foal in place until the vet arrived. Mr. Ping emerged first, with Mr. Pong following a few minutes later. Both chestnuts sported flashy blazes. Mr. Ping inherited his mother’s socks, but was small and weak, weighing about 25 pounds, compared to the plain-legged Mr. Pong, who pushed 70 pounds and nursed readily. “Normally, one is bigger than the other, and the smaller twin does not usually survive,” Morro said. “Most of the time they are stillborn. In this situation, he looked very underdeveloped. We knew it was going to be a lot of care. Mr. Ping continued to go through potentially life-threatening difficulties through his first months, but he was healthy enough to wean with his brother at 6 months old. Curtis took Mr. Pong, while Mr. Ping stayed with Morro for further care. Though he never grew to match his brother’s size, Mr. Ping was eventually deemed ready to join him in training. Unsurprisingly, Curtis identified the better-developed Mr. Pong as the more likely to succeed of the two, but the trainer said they both have their own strengths. Mr. Pong was set as the 3-1 second choice on the morning line for Friday’s 4 1/2-furlong race, while Mr. Ping is not far behind at 7-2. Morro said the Avonwood Farm staff would be out in force to watch the foals run. The colts have already developed a following on social media after Morro posted photos of them as foals nursing off their mother. Curtis expects the colts want more distance than they will see in their debut, but regardless of how they perform on the track, the trainer already sees potential for their second careers. Wishing them the best of luck in their debut, what a heartwarming story! Trainer Mark Casse has confirmed Florida Derby third Mississippi will target $300,000 Pat Day Mile (GIII) on May 5. @ChurchillDowns suspends @KentuckyDerby Future Wagers on colt before Pool 4 opens. Paved (3-Year-Old Filly) is entered on April 7, 2018 at SANTA ANITA PARK. A very impressive win by Analyze It (Point of Entry) in the 1 1/16-mile G3 Transylvania at Keeneland. This is a serious colt with a promising future on the grass. It's also nice to see Dynaformer's son, Point of Entry, doing well as a sire. BaroqueAgain1 wrote: A very impressive win by Analyze It (Point of Entry) in the 1 1/16-mile G3 Transylvania at Keeneland. This is a serious colt with a promising future on the grass. It's also nice to see Dynaformer's son, Point of Entry, doing well as a sire. That was truly scary. He's in a different league than his supposed competition. Tough ( if not impossible ) to compare dirt and turf horses, but he might be the most talented 3YO in the country. I love that he is by Point of Entry! Nice bounce back for Ax Man; blinkers came off and he relaxed a couple of lengths off the pace before taking over at the quarter pole. Could Ax Man be a potential Preakness runner, or does he look like a horse who will want to stay at 7-8 furlong distances? He looked very comfortable at 8 furlongs and I was also thinking he looks like a Preakness type. But it's hard to tell right here whether he wants to go farther.